Insulin Pumps Compared 2016, is here to help you make the decision on which Insulin Pump to choose as we outline the main features and benefits of the leading pump brands for 2016. Once you’ve made the decision to move from injections to an insulin pump the next step is to choose which Insulin Pump you want your child to have, or maybe you are changing from one Insulin Pump to another. Our Insulin Pump comparison guide can help you with that decision. All insulin pumps essentially do the same job, they deliver insulin without the need for injections. However each brand of Insulin Pump has different features and benefits which we outline below. 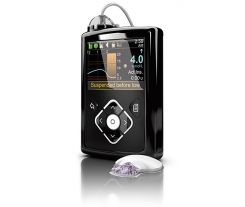 The Medtronic Minimed 640G is one of the newest insulin pumps to hit the market. Medtronic have a reliable history and are considered one of the leading brands, they have launched many versions of their pump over the years but the Minimed 640G has definitely caused the biggest stir. The pump offers an integrated CGMS option, using the Medtronic Enlite Sensors, though you may have to self fund these. If you choose to go down the integrated CGMS route this pump really comes into it’s own with the new SmartGuard capabilities. The CGMS can detect a hypo 30 minutes before it happens, the pump will then suspend insulin in a bid to prevent the wearer having a hypo, once bg levels have recovered the pump will resume. However you do need to have the sensors to use SmartGuard. The pump itself is discrete and modern looking available in a range of colours which is always popular with children. There is also a choice of insulin reservoir size, you can choose between 180 or 300 units so this could be ideal for teens and those with higher insulin requirements. The Medtronic Minimed 640G links to the Contour Next 2.4 Blood Glucose meter, the meter will transmit the BG reading to the pump, you can also administer a set dose of insulin from the handset, which may be handy in some situations but the handset doesn’t have the full capabilities of a separate handset that other insulin pumps offers, most of the brains are in the actual pump so to do temporary basals and corrections you will need to access the pump. The pump is waterproof and offers protection underwater up to 3.6 metres for 24 hours. The 640G also has the capability to deliver basal rates as low as 0.025 units per hour but only during times that less than 1 unit per hour is required. This would be particularly useful to very young children that are currently in the honeymoon period. For those that require more than 1 unit per hour the pump offers increments of 0.05. On the 640G you can set up to 8 different basal patterns, so you may choose to have a different pattern for different days of the week or school holidays etc. Within each basal pattern you can set up to 48 rates, which essentially means you can change rate every half an hour if you so required. WHAT MAKES MEDTRONIC MINIMED 640G DIFFERENT? SmartGuard Technology exclusive to this pump, allows wearers to avoid lows (not necessarily all hypos) though this is only available if you opt for the integrated CGMS which you may have to self fund. The choice of having the larger 300 units reservoir would be very convenient for those with higher insulin requirements over 3 days. COULD BE EVEN BETTER IF:- Many people enjoy having a separate handset to essentially use as a remote control for the pump, would be great to see this option eventually for the Medtronic 640G as most of the brains are currently in the pump. Some people are also put off this pump as they don’t want tubes, so it would be great to see a tubeless option too. When the Animas Vibe Insulin Pump was first launched one of it’s major selling points was the fact that is waterproof up to 12 feet, however since then many other pumps are also waterproof to the same specification. 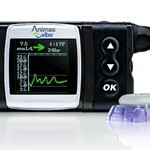 The Animas Vibe is a great pump for those that are looking for integrated CGMS as it’s currently the only insulin pump that offers integration with Dexcom CGMS. Like the Medtronic pump the Vibe is also available in a range of colours. The Vibe offers very small basal doses as low as 0.025. You can program up to a maximum of 4 different basal patterns, within each pattern you can add up to 12 different basal rates, essentially allowing you to change basal rate every 2 hours should you need to. There is no integrated BG Meter with this pump which allows you to choose a BG meter that you like the most, nor does it offer any kind of remote handset. There is only one size of insulin reservoir available which holds 200 units. WHAT MAKES THE ANIMAS VIBE DIFFERENT? 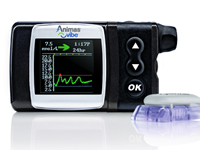 The Animas Vibe is the only insulin pump to offer integration with Dexcom CGMS, however many hospitals will not fund sensors and you may have to self fund. The low basal rate offered could also be very useful to families of children with very low insulin requirements. Having a remote handset would be very useful for many families, it would allow corrections and boluses without the need to access the pump around your child’s waist, particularly useful overnight when you want to do a correction or whilst your child is running around playing. The 4 basal patterns and 12 rates allowed would be plenty for most people though other pumps do give more options. Would also be great to see an option to have a larger insulin reservoir as 200 units may not last 3 days for users with higher insulin requirements. The Accu-Chek Insight Insulin pump is the follow up to the hugely successful Accu-Check Combo pump. Many choose this pump due to the colour, touch screen bluetooth handset that also offers an integrated Blood glucose meter. Without a doubt the handset is far more attractive than it’s predecessor. The separate handset means that the pump can be fully operated without a need to access the pump itself. The insight also features the option to use pre-filled insulin cartridges designed to make set changes easier though they only hold 160 units. The smallest basal rate available is 0.02 making it the smallest available on the market currently. A maximum of 5 different basal profiles can be programmed and within each profile you can set a maximum of 24 different rates. As seems to be standard on many insulin pumps the reservoir size is 200 units. The insight pump is only protected in water against temporary immersion. (60 minutes at 1.3M). The modern bluetooth handset is undoubtedly a highlight, particularly useful so that mums and dads dont’ need to access the pump to give a bolus, correction or even to set a temp basal. Teens will also be drawn to the modern design and the discretion that a remote handset can offer. Pre-Filled cartridges designed to make refills easier are also a plus point. The insight also offers the lowest basal rate on the market. The Accu-Chek Insight does not offer the same protection in water that most other pumps do. So it will need to be removed when swimming etc. The 200 Unit reservoir or 160 unit pre-filled cartridges may not be large enough to last 3 days for users with higher insulin requirements. Currently there is no option for integrated CGMS but that doesn’t mean you can’t use one, you’ll just need to buy a stand alone system. The Omnipod Insulin Pump is totally unique compared to other insulin pumps as there is no tubing, it’s known as a patch pump. The patch is stuck on to the body and contains the pump workings and insulin reservoir (about the size of a custard cream biscuit) it is controlled through a separate handset. You can see both components in the image above. Some people choose to go tubeless due to a fear of tubes, though there are other benefits to being tubeless, there is no need to remove for sports, PE etc, the Pod is waterproof also so there is no need to remove for swimming etc. Having no tubes also means less problems with air bubbles in tubing causing high blood sugars. 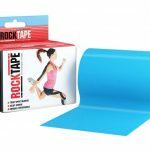 It’s also very discrete and often cannot be seen under clothing, there’s no need to use pump belts or anything like that to hold a pump around the waist. Another unique feature is the automated insertion (you never see a needle) you simply fill the pod, press a button to prime, stick it to your chosen site and press a button on the handset to fire and insert the cannula. Each Pod can hold up to 200 units of Insulin. This may not be enough for some and you will need to change the Pod more often than 3 days if you require more than 200 units. The Minimum basal rate is 0.05 units per hour, which is larger than some other pumps, for most this will not be a problem but other pumps can offer smaller rates. You are able to set up to 7 different basal profiles and within each you can set up to 24 different basal rates in 30 minute increments. The PDM (handset) also includes a built in Blood Glucose meter that uses Abbott Freestyle Strips, these strips need one of the smallest blood samples on the market. WHAT MAKES THE OMNIPOD INSULIN PUMP DIFFERENT? The tubeless design is totally unique and has many benefits that’s we’ve described above. It’s also beneficial to many people to have a separate handset. Automated insertion is also unique making Pod changes fast and simple. The current design of the handset is rather outdated but it is robust. Also there is no option for integrated CGMS so a stand alone system would be required if you plan on using CGM. Other pumps offer smaller basal rates which may be better suited to very young children. A larger reservoir would also be of benefit to some but this would likely increase the size of the Pod. For more information on insulin pumps you may find the following sections of our website useful. Omnipod Review – An in depth review, detailing all the features, benefits, pro’s and con’s. Insulin Pump Reviews – This section of our website contains real life user reviews on all the main pumps for 2016. Insulin Pumps VS MDI – Can an insulin pump improve HBA1C, take a look at our study results. So there you have it a guide to the leading insulin pumps for 2016. 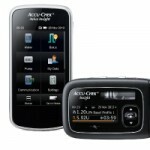 A tip when choosing a new Insulin Pump is to create a wish list. What features and benefits are important to you? Create a list. Once you’ve done that you can research each pump carefully and see which insulin pump ticks the most boxes on your wish list. Hopefully you’ve found this guide to Insulin Pumps compared useful, if you are already using one of these Insulin Pumps feel free to leave your reviews in our comments section below to help others that are choosing a new pump.Why not subscribe for free email updates from Children With Type 1 Diabetes, to receive the latest Type 1 news and reviews. Simply pop your email address in the box below.